Sciblogs | Science, sexism and the media. Science, sexism and the media. So lets start at the beginning, I’m an engineer and a scientist and I’m passionate about communicating science and trying to get others to be passionate about it too. Should you go to your doctor about that lump you’ve found and if so what should you ask? Should you use paper or plastic bags to take home your shopping? Should you be worried about climate change? Scientists can be scary and sometimes intimidating, with their endless qualifications and constant use of long words. I have been working tirelessly on learning the skill of talking about science without all of those scary words so that the conversation can be had by all, not just the elite few. I’ve been trying to change the perception of scientists by working really hard on a voluntary basis, all in my spare time to take this challenge on. Because I feel passionately about providing our daughters with a positive role model for an educated female who is successful in a very male dominated field. Because I think that we as a Nation need to address some big questions about the future of our country including how we are tackling pollution, investment in education and the fight against obesity. Because our TV shows are filled with reality TV of cooking races and house building races and following people around who seem to be famous for no other reason that just being rich. I blog – you know this because you are reading it right now. I visit schools and community centers to show children that there are many different aspect to science and some of it is quite fun. I give public lectures, some of which are available online. I go onto TV shows (Firstline and The Paul Henry Show) to talk about science news topics. I am regularly on the radio talking about science both in my field and in other science news. I create my own video’s which try to showcase my sense of humour and personality as well as talking about science. I do all of the above for free! Actually it costs me money to do this, my own hard earned money. I choose to donate 20% of my salary to this cause, so that children have fun experiments to run, so that I can drive to a remote school that doesn’t have a well equipped lab and so that the public can access a scientist to answer the questions that they have. I have people around me who volunteer and do this for free too, media production companies, owners of venues, parents of children. I am not paid to be on TV or on the radio and that may come as a surprise to you but this is me devoting my life to a cause that I feel strongly about. Because we do not have dedicated science TV shows on our national channels, it’s quite difficult to get any airtime for the subject. TV3 has actually been great at offering a weekly 5 minute science slot at 8:15am on Firstline, Wednesday mornings purely for science and The Paul Henry show, although doesn’t commit a regular slot, has been open to having scientists on to chat for 5 minutes about science. So I’m grateful to the Paul Henry show for allowing me to have some airtime to discuss new discoveries in science. I also like Paul’s off screen persona and he has been nothing but courteous and respectful to me during the handful of times that I have met him. Yes, I’m not naive to the reputation that Paul has and I go on to his show prepared for a question that may be slightly off topic or controversial, but I’m an intelligent female who works in a very male dominated field, and I’m used to inappropriate and sexist comments and questions, it goes with the territory of being a female engineer! Perhaps my past experience of being the only woman in a meeting (and asked to make the tea), or being told that if I want to be taken seriously I need to wear shoes with less of a heel as they could distract the men in the room has made me a little immune to sexism and a little more tolerant of comments that I should be offended by. 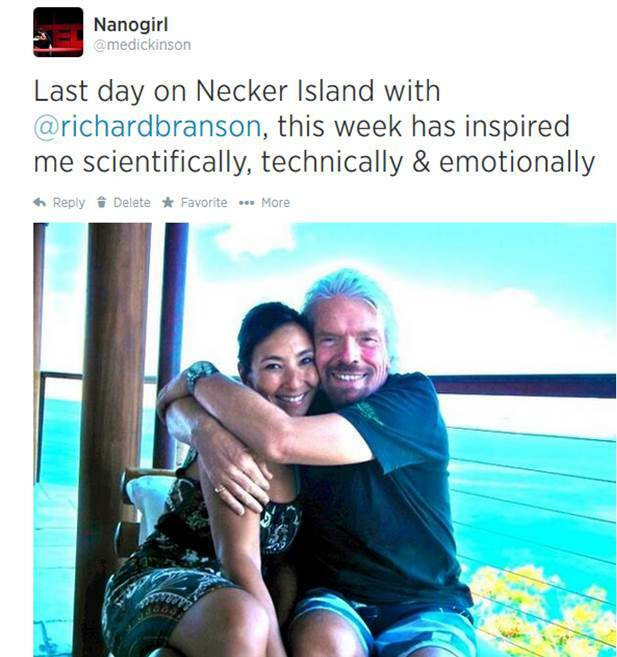 So two weeks ago, I happened to be on Necker Island with Richard Branson and a group of other incredible people talking about science, innovation, entrepreneurship, and business successes. You may know this because a prominent New Zealand newspaper ran the story, without my permission by taking this photo from my twitter account. I understand that anything I put out on twitter is public property, and although I was posting it to share my excitement with friends and colleagues, I didn’t think that a whole news story would be created without any input from me. This caused a lot of media attention and upon my return to New Zealand I chose to give a Campbell live interview to set the record straight and talk about the scientific and technical conversations I had on the trip. Later that week I gave the keynote talk at the Entrepreneurs Challenge in Auckland and at the social part of the event after my talk, a lady came up to me and asked me if I had slept with Richard Branson while on the island. I’ll admit I was a little taken back by the question, and slightly offended at the implication that I would be the type of woman who would sleep with a married man when I was a smart woman who was there for science. I immediately said that I did not sleep with him and she shrugged and said “well you know its the question that everybody wants to know”. I don’t know who “everybody” is, but as the week went on, more and more strangers (both men and women) in the street who recognised me from the media articles asked me the same question. It made me think about sexism in science and the conversations that I’ve had with many female colleagues about how difficult it can be to gain respect as a female scientist and how we seem to have to jump through many different hoops including how our appearance and personality affects our profile much more it would a male scientists. When the Paul Henry show asked me if I would come on to talk about science topics last Wednesday, and more importantly for me, about my new 100 days project which I’ve created to address the issues with have with encouraging our children to engage with science I said yes. Let me tell you that going on live TV is incredibly nerve wracking (I’m not a professional, I’m a scientist), and while I was in the make-up room before going live, I was frantically trying to memorise the facts and figures that I would need to remember about the science topics I was about to discuss. Paul popped his head in to say hi, and we quickly chatted about the 3 science topics that we would discuss, as he left I said “phew, and here was I thinking that you would be asking me questions about Richard”. Paul turned and gave me that cheeky look that he has, and I knew that he was up to mischief. I don’t remember the exact words that were exchanged (because my brain was panicking about remembering the science statistics for the show), nor did I know that the show had planned to show the photo of Richard and I from my twitter account, but Paul implied that he was going to get cheeky with a Richard question and I knew the exact question that had been on everybody’s lips as I’d been asked it so many times already that week. The producers of the show had no idea Paul was going to go into cheeky mode, I think one of the reasons why he has a late night show is because Paul can be a little unpredictable and very unPC sometimes. The show went live and I got to discuss the science topics, and then as the slot was wrapping up, Paul asked me in his typical cheeky manner, if I had done the deed with Richard, to which I replied (as I had done many times before) that I hadn’t. I thought it was funny, I wasn’t outraged and it was the jokey type of question I would expect from Paul on a late night show that had strippers on right after me. The next day Mike Kilpatrick wrote an article about the incident which set off a media roll and allowed me to read comments from the public about how offended I should have been. It got me thinking, perhaps I should have been more offended? Perhaps it was sexist? Perhaps I’m not a good role model? Perhaps I should stop making my life hard and just go back to being a boring, non-communicating scientist? Then I see the e-mails and letters that I get from children who are inspired by what I do and want to do more science, by adults who went to the doctor to discuss a scary lump because I explained the symptoms of a serious disease in easy language on TV, by young girls who now want to be a scientist rather than a Kim Kardashian lookalike. I realised, that only I can make the decisions on whose show I choose to go on and my reasons for doing that. 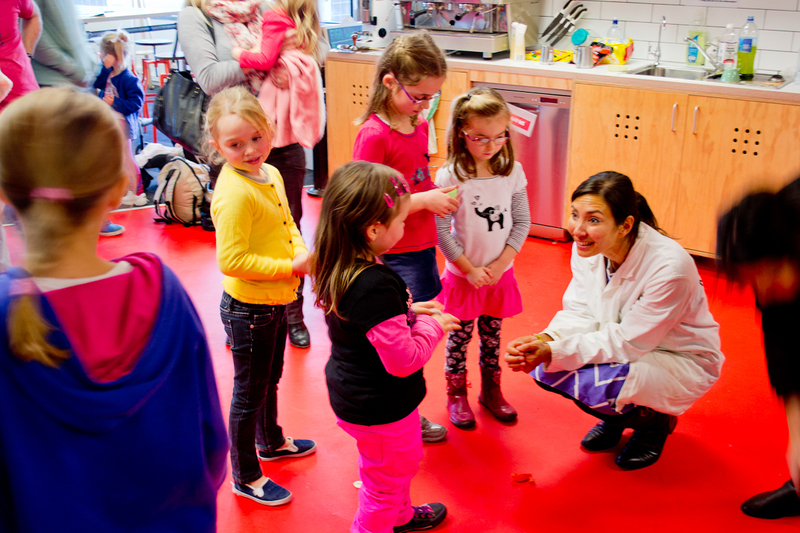 Until we can get funding for a prime time dedicated science program accessible to all, scientists like me will keep having to throw in our 5 minutes wherever we can because we feel its important to talk about science. I know that my comments will mean that others will write negative things about me and my lack of self respect and lack of feminism values and that’s OK, because I’m doing the best that I can with zero budget and nothing but a passion for positive change to drive me. So that’s my story, and if you are interested in the things that I do that I would like to make news, then yesterday I gave a speech about why I think the New Zealand government should invest more in sustainable R&D for our future economy and I’m also running 100 days of science where I’m encouraging children in New Zealand to have fun with science at home. So yes, I’ll likely go onto the Paul Henry show again, because it’s one of the few shows that includes science. How about we use this momentum to address the issues we have with the content of the national TV shows that we fund in this country and push towards funding some more smart science ones? I’m somewhat embarrassed by the knock-on effect my blog had, especially as a former sciblogger. I think you do a wonderful job giving science prominence in the media in New Zealand. However the very last thing I wanted to do was make life more difficult for you or to cause you to wonder whether or not you aren’t a good role model because your reaction wasn’t what some expected it to be. I think EVERYONE who asked you whether you slept with Richard Branson is sexist and wildly misguided. IMO, for TV3 to hid behind the ‘we’re just asking what everyone else is asking’ after the blog yesterday is mischievous, given there was no context to that question – and I firmly believe it had no place being there or wouldn’t have been brought up should it have been a male scientist in that position. So I apologise if I have made things difficult for you, given you already do a hugely difficult job in an arena which is sexist as it is. It has, however, given me some pause to think about another blog I could write – this time about ensuring some smart science shows on our television. Maybe I can work with you towards that and redeem myself for putting you in such an awkward position. I didn’t watch the show, but I was a bit shocked to hear that you were asked that question. Despite having seen and read a fair bit about your trip I can honestly say it never crossed my mind. I’m glad this won’t stop you from continuing any of your great science communication work. Feel free to ignore any and all comments, including this one, regarding how you “should” react to something. You’re the only one who gets to choose how you react to anything. I used to do a technology segment with Paul Henry on TVNZ Breakfast. He was fun to work with but unpredictable. During the ad break, he’d be trying to break the gadgets I was about to talk about on air! But I mentally prepared myself for all of that and tried to be ready for anything. I was never confronted with the likes of what he said to Michelle, but I can relate to Michelle’s reaction – ie that’s Paul, get over it. No one has to go on the Paul Henry show, but those who do get a valuable opportunity to talk about what they do in a slightly edgier format that appeals to a type of audience that perhaps they wouldn’t get to otherwise. No one should be made to feel embarrassed or demeaned on live TV and I’m not defending Paul Henry – it was a lame thing to say. But I respect Michelle’s effort to put it in perspective. I’m also not sure that dedicated science shows are realistic or even the answer for NZ. The fact that a mainstream audience is getting a small dose of science on shows like Paul Henry, may ultimately be more effective. But a decent NZ science show would be great too! Michelle, I think what you do is absolutely amazing. I disagree that that question is one that “everyone wants to know” let alone one that everyone would think of. It shows a gutter level mindset that probably develops after watching one too many episodes of the Kardashians. Bring on a NZ based TV show asap. Like Michael, I don’t think that particular question was an ‘everyone wants to know’ one; I saw it more as coming from the gutter. Please keep on being your awesome & inspirational self! ……(they don’t do they? )……..oh jeez…..what? When?…How?…They don’t have time……do they?….. They do! Phew….I thought I was different…. The question was indicative of TMMDDTV* take on who or what should be science. The take was, Michelle, female, scientist, good looking, late night, well……as for the question, she’s asked for it. It would never – ever – be asked of a male. And that’s the point. Got them right in the goolies. *The main stream media dumb downed TV. It’s pretty disappointing, the idea as a scientist, no matter how cool the stuff you are working on it, that this would be the question asked. I’d really like to think this isn’t a perception given to younger potential scientists. Paul Henry’s comment trivialised both you as a person and the work you do. In my opinion, by going along with it and saying you would appear again on his show, I think you legitimate both his sexism and his calculated appeal to the lowest common denominator in society. That question would not have been asked of a man – at least not on camera – and it sets a standard, a very low one. Henry knows how far he can push boundaries but many of the people he appeals to will view what he says and does as license to behave far worse. maybe i am a challenged male, but how is asking if she slept with Branson sexist? Inappropriate, yes. Idiotic, highly likely. But sexist? If Branson was asked the same question, would it be sexist?